Be the first to share your favorite memory, photo or story of Rodora. This memorial page is dedicated for family, friends and future generations to celebrate the life of their loved one. Rodora Estella Taylor (Billy), 85, of Elk City, Oklahoma was born on July 10, 1933 in Cordell, Oklahoma. She is the daughter of H.R. and Rhoda Ellen (Davis) Archer. 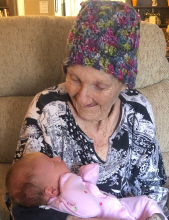 She met her heavenly father on Tuesday, February 5, 2019 at Elk City Nursing Center in Elk City, Oklahoma surrounded by her loving family. She married Robert Gerald Eugene Taylor September 15, 1953. Robert preceded her in death on October 13, 1995. Billy enjoyed sewing, working in the yard and camping. She loved traveling to Missouri and fishing. Funeral services will be held at 2:00 p.m., Saturday, February 9, 2019 at the Martin-Dugger Funeral Home Chapel in Elk City, Oklahoma. Ronald Putman will officiate. Interment will be at Fairlawn Cemetery in Elk City, Oklahoma. Services have been entrusted to the care of Martin-Dugger Funeral Home in Elk City, Oklahoma. She is preceded in death by her husband, Robert and her parents, H.R. and Rhoda Archer; two sisters, Mary Ann Hudson, Mabel Anderson; one daughter, Pam Willis; one son-in-law, Garvin Willis. Memorials can be made to the Alzheimer’s Association in care of Martin-Dugger Funeral Home, P.O. Box 707, Elk City, Oklahoma 73648. To send flowers or a remembrance gift to the family of Rodora (Billy) Taylor, please visit our Tribute Store. 600 W. Country Club Blvd. 600 West Country Club Blvd. "Email Address" would like to share the life celebration of Rodora (Billy) Taylor. Click on the "link" to go to share a favorite memory or leave a condolence message for the family.